Wave goodbye to dry hands with this intensive treatment. A rich blend of four oils and other all-natural ingredients work to moisturize, heal and protect. Stay put formula remains on skin even if you get your hands wet. Smooth onto hands and allow crème to absorb into the skin. Use throughout the day as needed, and before retiring..
4 fl oz. (119 ml). These products are made to order, please allow several days for shipping. 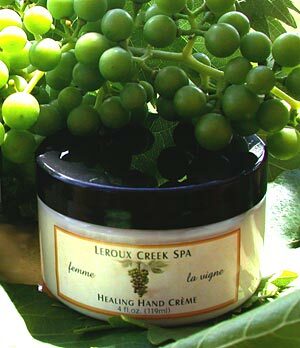 Copyright Leroux Creek Spa. All Rights Reserved. eCommerce Software by 3dcart.